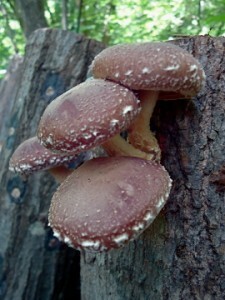 The Cornell Small Farms Program announces a new development in the emerging log-grown mushroom industry; New York State has officially designated “actively managed log-grown woodland mushrooms” within the meaning of the term “crops, livestock and livestock products,” for purposes of provisions of law relating to agricultural districts. The bill, introduced by Bill Magee in the Assembly and sponsored by Senator Patricia Ritchie in the Senate, was signed by Governor Cuomo in September and means that farmers will be able to designate lands used for cultivation as agricultural, leading to tax breaks and other benefits. The provision further clarifies that mushrooms are seen as a significant agricultural crop and designates the intentional farming of mushrooms from wild harvesting. 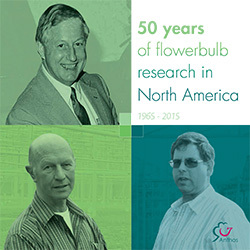 Flower bulb expert Bill Miller is featured in a new book 50 years of flowerbulb research in North America, published by Anthos, the Dutch flower bulb exporters association. Miller is a professor in the Horticulture Section of the School of Integrative Plant Science and director of Cornell’s Flower Bulb Research Program. The Dutch began funding flower bulb research in the U.S. in 1965, sponsoring a program at Michigan State University. “The Dutch were very forward-thinking,” says Miller. “They realized that they would sell more bulbs to U.S. growers if the growers on this side of the Atlantic had technical support — in English. The Dutch strategy paid off. Bulb and forced flower bulb retail sales in the U.S. easily top $125 million, says Miller. The Dutch-funded research program shifted to North Carolina State University in 1978 before coming to Cornell in 1998. 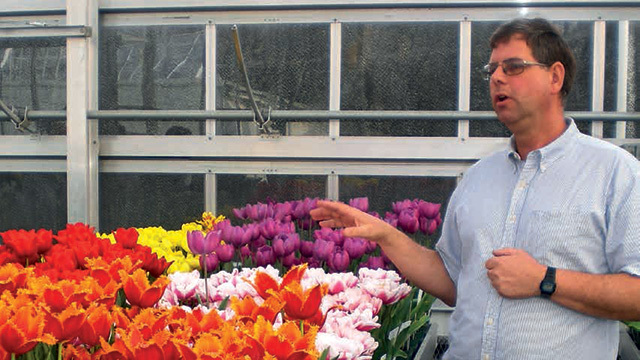 Miller, the son of a lily grower and an authority on flower bulb physiology, has headed the program since. 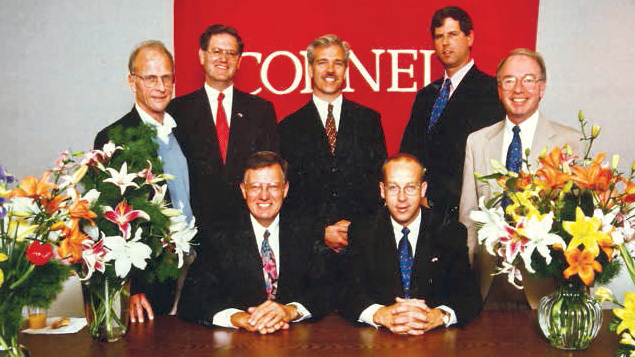 Among the attendees at the signing of the Anthos-Cornell research contract in 1997 were horticulture professor Bob Langhans (left), CALS Dean Daryl Lund (front left), Bill Miller (second from right) and Floriculture and Ornamental Horticulture chair Tom Weiler (right). The Cornell research program has focused on testing new varieties, helping growers time their blooms to hit holiday markets, and using plant growth regulators to control the height of potted bulbs. Each year, Miller hosts a Dutch intern to assist with the research. In addition to forcing studies, Miller has also conducted studies to determine which landscape flower bulbs are least likely to be damaged by deer and voles and other topics. Perhaps Miller’s most celebrated study came in 2005 when a New York Times columnist asked him about the veracity of the folk wisdom that you can use alcohol to keep forced paperwhites from growing too tall, a dilemma faced by thousands of bulb enthusiasts every winter. To find out, Miller initiated a research project carried out by undergraduate Erin Finan. Finan’s study determined that the most effective way to keep paperwhites from flopping over is to grow them in a 4 to 6 percent alcohol solution, or 1 part 80-proof liquor to 7 parts water. The study went viral, with the technique receiving coverage in Parade Magazine, der Spiegel, CNN and countless magazine articles, blog posts and newscasts. “You can still tell when the winter forcing season is coming on because you’ll start seeing ‘pickle your paperwhite’ articles citing the study,” says Miller. 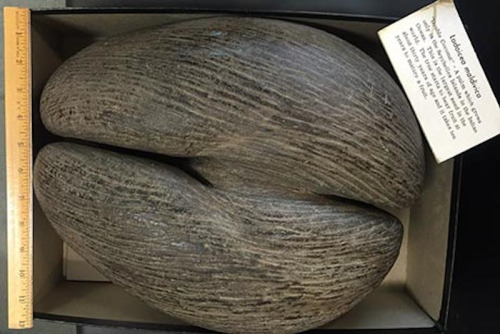 The world’s largest seed, called a “double coconut,” from the fruit of a palm called a Coca de Mer from the Seychelles. The fourth floor of Mann Library on campus houses the Liberty Hyde Bailey Hortorium Herbarium, a collection of more than a million dried and preserved plant specimens. The roots of this botanical library of pressed leaves, branches, flowers and seeds go back to Cornell’s beginnings. In 1869, Andrew Dickson White purchased a collection called the Wiegand Herbarium for $1,000 from Horace Mann Jr., the son of an educator who helped develop the nation’s public school system and an acquaintance of naturalist Henry David Thoreau. Then, in 1935 Cornell plant biologist Liberty Hyde Bailey donated his private 150,000-specimen herbarium to Cornell. The two herbaria were combined in 1977 under the umbrella of the Hortorium, a Cornell department in the Plant Biology Section. Bailey coined the word hortorium to mean “a collection of things from the garden,” said Peter Fraissenet, assistant curator of the herbarium, one of the largest university-affiliated collections of preserved plant materials in North America. 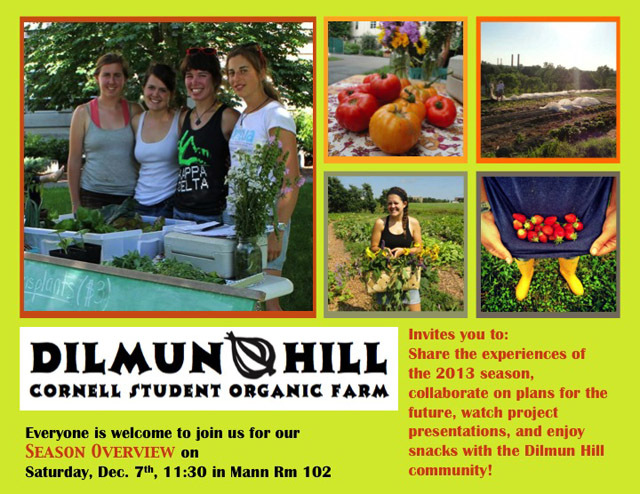 On behalf of Dilmun Hill Student Organic Farm, I would like to invite you to join us this Saturday for our season overview December 7, 11:30 a.m. in Mann Room 102. Come share the experiences of the 2013 season, collaborate on plans for the future, watch project presentations, and enjoy snacks with the Dilmun Hill Community! 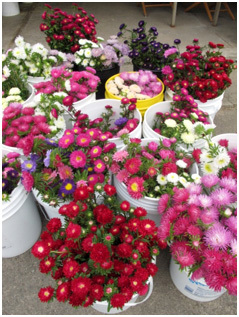 Wien also reports on variety trials of Carthamus(Safflower), Celosia, Chrysanthemum, Cynoglossum, Eucomis, Gomphrena (Globe Amaranth), Larkspur (Consolida), Lisianthus (Eustoma), Marigold, Pepper (Capsicum baccatum), Snapdragon (Antirrhinum), and Stock (Matthiola). To see previous years’ reports, visit Wien’s research page. Cornell researchers convened a daylong meeting of 50 researchers and growers from across the Northeast and Canada this past November to consider strategies for managing the invasive spotted wing drosophila — SWD for short. Photo: Bev Gerdman, Washington State University. 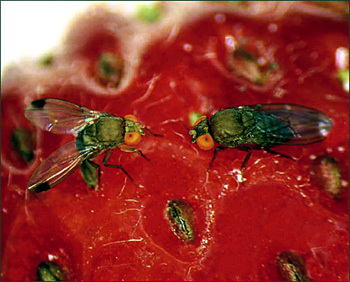 Scientists tackle tiny fly that’s big trouble for berry growers [Cornell Chronicle 1/4/2013] – Spotted wing drosophila — SWD for short — is poorly understood and highly destructive. “That’s a terrible combination,” says Julie Carroll, the fruit integrated pest management (IPM) coordinator for the New York State IPM Program, based at the New York State Agricultural Experiment Station (NYSAES) in Geneva, N.Y. Cornell researchers convened a daylong meeting of 50 researchers and growers from across the Northeast and Canada this past November to consider strategies for managing the pest. Worms Produce Another Kind of Gold for Growers [New York Times 12/31/2012] – Eric Nelson, Dept. of Plant Pathology and Plant-Microbe Biology, is studying how compost suppresses disease. “The key is understanding why these microbes do what they do,” he says. Still, the industry suffers from image problems. “It’s hard to bring it out of the ‘It’s cute to have a worm box in my backyard’ approach and put it on par with other strategies for waste management,” says Allison Jack, who earned her doctorate by studying vermicompost at Cornell and is now teaching at Prescott College in Arizona. Checking in with Nina Bassuk & Cornell’s Urban Horticulture Institute [City Trees Nov./Dec. 2012] – In an extensive interview, Bassuk details progress on plant selection, propagation, porous paving, ground-penetrating radar, bare toot transplanting, and more.